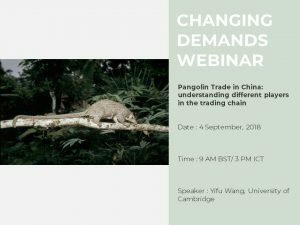 Upcoming webinar session on Pangolin Trade in China will be delivered TOMORROW at 9 AM BST/ 3 PM ICT by Yifu Wang from the University of Cambridge. Yifu will talk about her work around the pangolin markets in China focusing on 1) an overview of pangolin trade participant profiles and the conservation actions that have been carried out targeting different participants, and 2) more specifically the consumption of pangolin related to the traditional Chinese medicine (TCM) market. Find out how to join via this link.